It’s been said that the best bridge between despair and hope is a good night’s sleep—and that’s exactly what Purple, Inc. offers. Purple founders Tony and Terry Pearce set out to build the world’s most comfortable mattress, one that guaranteed millions of people their best sleep ever, at an affordable price. In January 2016, after years of researching cushioning, the company started shipping Purple mattresses, entering the marketplace at a time when the “bed in a box” mattress delivery to your door step, was a new frontier. Amazon Pay reduces the number of clicks and customer inputs during the checkout by at least 75%. Since introducing Purple® Bed, the world’s first no pressure mattress, the company has experienced explosive growth. “We’ve grown from 40 employees to almost 600 in a year’s time,” says Byrant Garvin, Marketing Director at Purple, Inc. To keep up with the demand for its products, the company needed a cutting-edge e-commerce platform and payment solution. Purple chose Shopify for its online store, adding Amazon Pay as one of its alternative payment options. 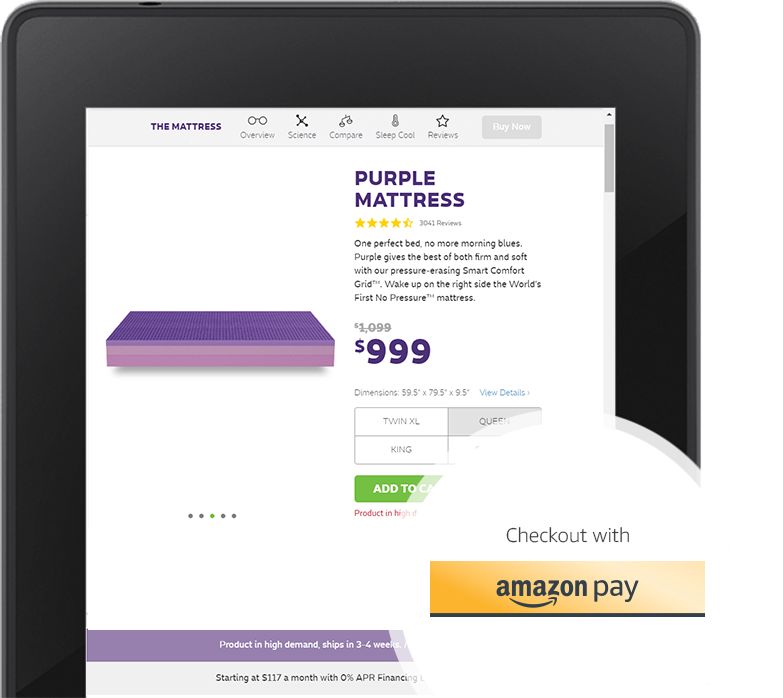 With Amazon Pay, Purple has improved the checkout process, fostered customer trust, and thereby increased mobile conversions. The combination of Amazon Pay and Shopify is providing the company with a scalable solution to handle its swift growth. With as many as 80% of Purple’s customers shopping from mobile devices, it was critical the company provide a flawless mobile experience. “We wanted a simple and easy-to-use payment option, especially on mobile, and with Amazon Pay, you just sign in to your Amazon account, tap the screen a few times, and you’re done,” says Dan Bischoff, Acquisitions Team Lead at Purple. “It doesn’t get any easier than that.” On average, about 20-25% of Purple’s payments are made by mobile shoppers, while an impressive 44% of Amazon Pay shoppers are checking out through their mobile devices. There is a level of trust with Amazon. People are used to checking out with Amazon, I don't see anyone who doesn't have an Amazon account. Another major advantage of Amazon Pay has been the fast checkout experience. The simplified process has meant fewer cart abandonments and more customers completing their purchases. "Amazon Pay reduces the number of clicks and customer inputs during the checkout by at least 75%," says Garvin. "In the end, the less friction we have, the less chance of cart abandonment." The increased conversions, along with Amazon's global recognition, are adding up to greater trust in the Purple brand. Bischoff and Garvin believe Amazon Pay provides the validation startups like theirs need, ultimately strengthening Purple's reputation and bolstering its growth.